Stonyfield is sending one lucky winner and 3 guests on an unforgettable trip to South Africa with a new Sweepstakes running online through December 31, 2017. The grand prize includes airfare, luxury lodging, private safaris, and more. 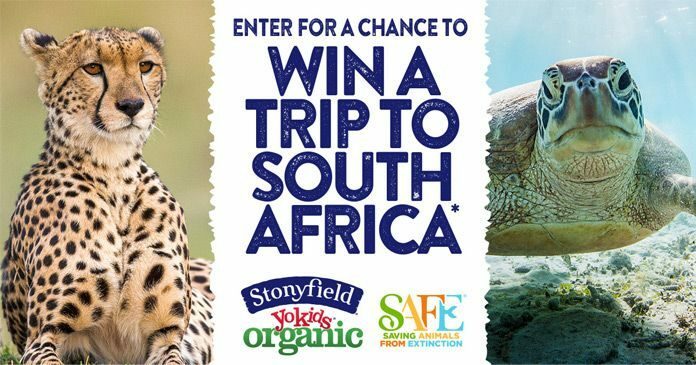 The Stonyfield Trip to South Africa Sweepstakes is open to legal residents of the United States (excluding Alaska, Hawaii and Puerto Rico and all other U.S. territories and possessions outside of the United States and where otherwise prohibited by law) who are 18 years of age or older at the time of entry in the Sweepstakes, and have lawful access to the Internet. The Sweepstakes begins at 9:00 am EST on August 1, 2017 and ends at 11:59 p.m. (EST) on December 31, 2017. To enter, visit http://www.stonyfield.com/azasafe/africasweeps during the Sweepstakes period and navigate to the Sweepstakes entry page. Follow the instructions on the entry page and accurately and truthfully complete all mandatory elements of the entry page. Limited to only one (1) entry per Sweepstakes participant during the Sweepstakes Period. drawing to be held at the conclusion of the Sweepstakes period. One potential winner will be randomly selected by Sponsor, whose decision will be final and binding, from all eligible entries received during the Sweepstakes Period 2 business days after the Sweepstakes Period ends. Lodging for a total of four (4) individuals for three (3) nights accommodations at the More Quarters in Cape Town, three (3) nights accommodations at the Tinga Lodge or Narina Lodge, subject to availability and age of any minor child(ren), at the Lions Sands Game Reserve, and three (3) nights at the Lepala Lodge at the Madikwe Game Reserve. between accommodation locations, and for any travel to visit the penguin colony and on the day of unscheduled activity. Breakfast at the More Quarters and breakfast, lunch and dinner at the Tinga Lodge or Narina Lodge, and the Lepala Lodge. Meet and greet services in Johannesburg and Cape Town. One (1) day visiting an African penguin colony. One (1) day of unscheduled activity to be determined by the winner. Four (4) days of safari activities, with two (2) days to be provided at the Lion Sands Game Reserve and two (2) days to be provided at the Madikwe Game Reserve. $500.00 stipend for meals and incidentals in the form of a VISA gift card to be awarded to the winner. The approximate aggregate ARV of the prize is $47,904. post the first name, last name initial and home city and/or state of the winner on its website, www.stonyfield.com, until at least March 31, 2018.